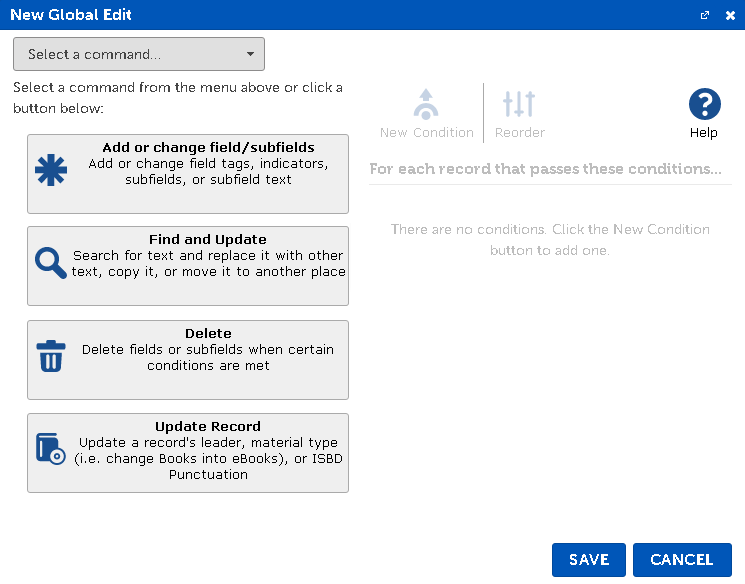 A Global Edit Command defines the basic function you want to perform on your MARC record. When creating a new global edit, the first thing you must select is a Command. Once a command is selected, the screen updates to display the specific options related to the command. Add or change field/subfields - Add or change a field in the record, including its tag, indicators, or subfields. Find & Replace - Finds text in the MARC record and replaces it with different text. Delete - Deletes fields and/or subfields from the MARC record. Update Record - Modifies an existing field in the MARC record. Field to update - Select the MARC field this Global Edit will update. Use the Field Selection window to choose which field to add or update. If missing - if the MARC field with the entered tag does not already exist in the record, a new field is added to the record. Always - always add a new field and only applies changes to that new field. The new field uses the default indicators for the given field unless they are specified in the Change indicators option. Change field tag - Check this box to change this field's tag using the Field Selection window to choose a new field tag. Change indicators - Check this box to change a data field's indicators and enter the desired indicator value(s) here. Leave an indicator value empty to use the default indicator for this tag. 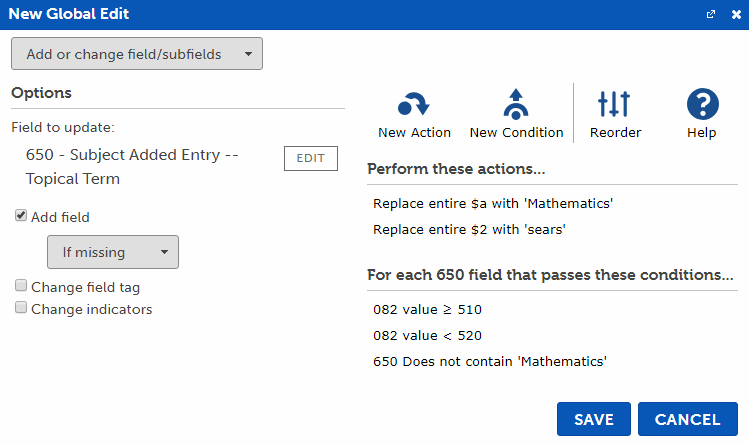 Add Actions to define the changes you wish to make to fields or subfields. Add Conditions to specify the criteria which the field or record must meet in order to make changes. Changes are only made to the record if the conditions are met. Search all fields - Look for the Find text in all data fields in the MARC record. Search specific fields or subfields - Enter a comma-separated list of fields, subfields, or ranges to look for the Find text. Specify subfields as a tag with the identifier after it (i.e. 650a). Specify ranges with a dash between the starting and ending tags (i.e. 600-699). Click Browse... to use the Field/Subfield Selection window to select by name. Find - Enter the text to find. This is a required field. Match case - When checked, the case of the find text must be exact. (i.e. A does not equal a). When unchecked, the case of the text is ignored (i.e. A equals a). Whole words only - When checked, the find text must exist as a whole word surrounded by either spaces or the beginning or end of the subfield. For example, finding "cow" as a whole word does not match the "cow" in "coward". Replace - Enter the text to replace the found text with. If left blank, the edit removes the Find text. 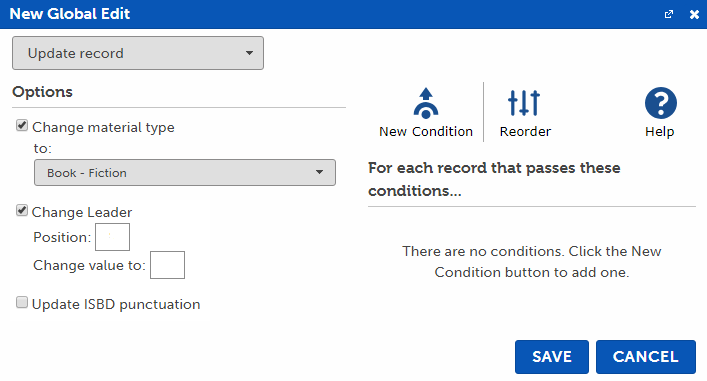 Add Conditions to specify the criteria which the field or record must meet in order to make changes. If the conditions are not met, no changes are made to the record. 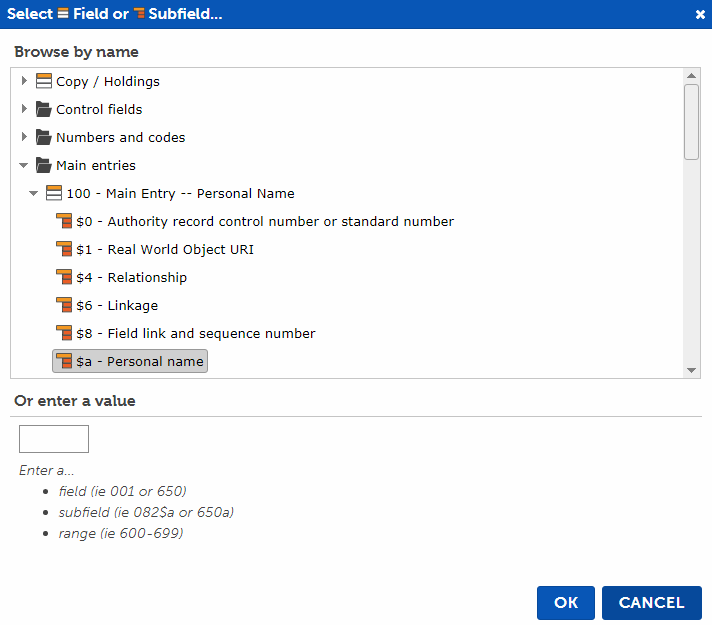 Single field - Enter a data field tag (i.e. 010). Range of fields - Enter a starting and ending field tag, separated with a dash (i.e. 900-999). Subfield - Enter a subfield as a tag with the identifier after it (i.e. 650a). Click Browse... to use the Field/Subfield Selection window to select by name. Add Conditions to specify the criteria the field or record must meet to be deleted. No changes are made to the record if the conditions are not met. Conditions can check each individual field, or the record as a whole. 520 -- $a Tells colors of animals, and how many items they have. 650 -1 $a Animals. $v Fiction. Delete any subjects that have the word "Animals" in it. 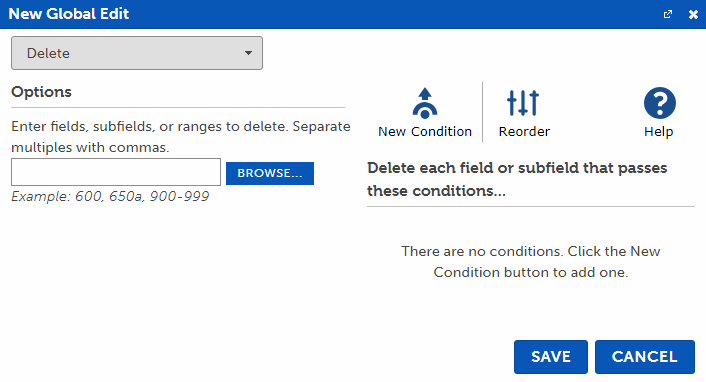 In the command options section, enter 600-699 to process the 600-699 fields. Add Condition: The field to delete / Contains / Specific text 'Animals' to check each 600-699 field, and if it contains "Animals", it is deleted. Delete all the subjects if one of the 650's has the word "Animals" in it. Add Condition: Other field or subfield '650a' / Contains / Specific text 'Animals' to check that the record contains any 650 $a subfields that contain "Animals". Because at least one does, the entire range of fields is deleted. Use the Update Record command to update characteristics of the entire record. Change material type - Check this option and select a new Material type from the list. This changes the core control fields and data fields/subfields in the entire record to the new material type. Update ISBD punctuation - Check this option to update the entire record's ISBD punctuation. Add Conditions to specify the criteria which the record must meet in order to perform these updates. If the conditions are not met, no changes will be made to the record. 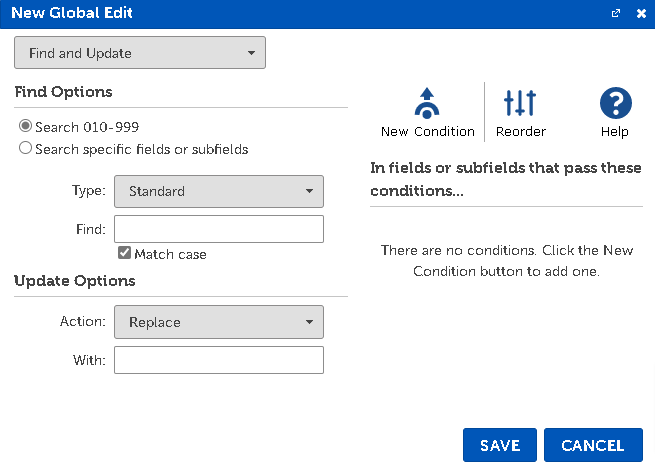 When asked to select a field or subfield, use the Selection window to browse through the fields or subfields by name instead of needing to know their MARC field tag or subfield identifier. Browse by name - Click the arrow or double-click on a folder to expand or collapse it. Click on the field or subfield you want to select. Double-click an item to select it and automatically close the selection window. Fields are grouped into folders. Copy/Holdings uses the Library Automation System (LAS) setting in your Profile to determine the actual field in your MARC records. You select it by name and BestMARC translates it to the appropriate field for your LAS. Subfields are grouped under their field. Subfields are sometimes hidden based on the context of your selection. Enter a value - Type the value into the Value box and press the Enter key to close the window and select it. Valid types are listed in the value box (i.e. field, subfield, or ranges) based on the context of your selection. Click OK to close the window and select the entered field or subfield.